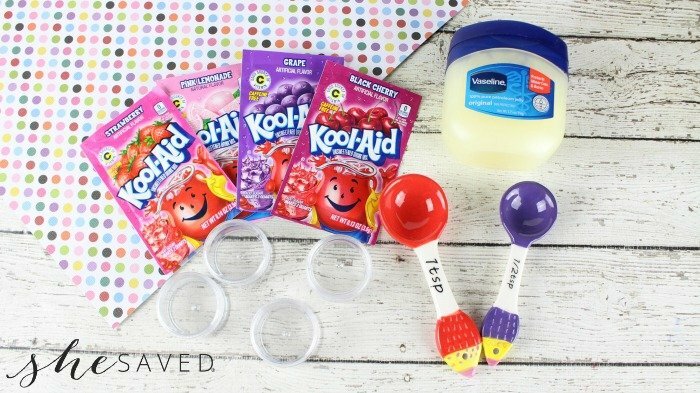 Your favorite flavors of Kool-Aid – I used strawberry, black cherry, pink lemonade and grape. 1. Add 1/3 cup Vaseline to a microwave safe bowl. 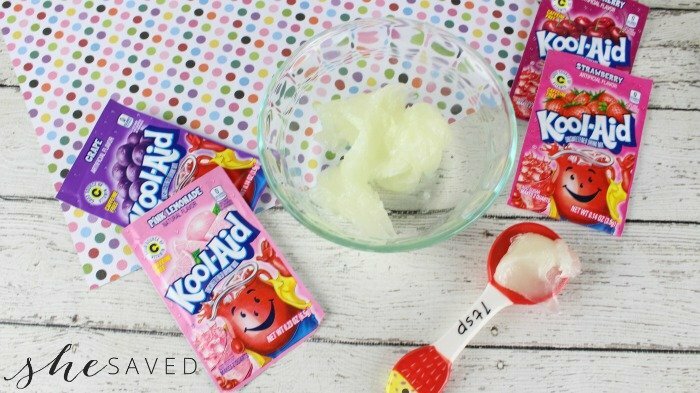 Microwave the petroleum jelly on high for 40-45 seconds or until soft and mostly melted. Stir. 3. 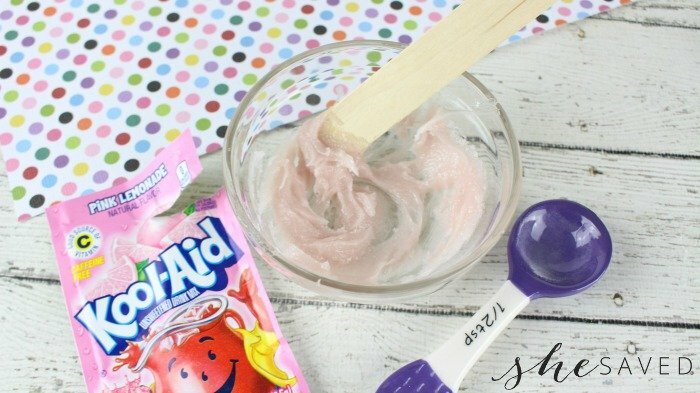 Sprinkle 1/2 teaspoon of your favorite Kool-Aid powder into each bowl and stir with wooden craft stick or spoon. Optional – you can add a pinch of granulated sugar to each bowl if you want the balm to be sweetened. 4. 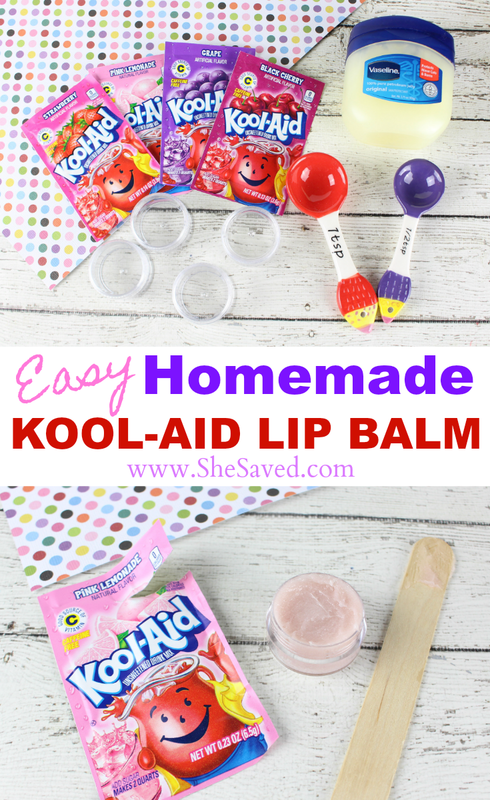 Transfer each flavored lip balm mixture to an airtight container and use for up to 3 months. 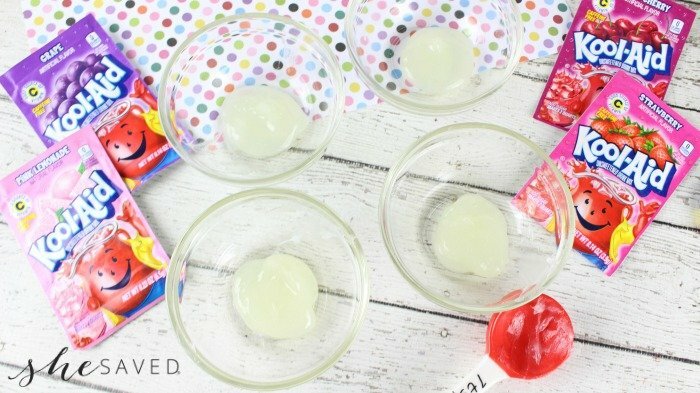 This recipe can be easily doubled or tripled for a girls Valentine or birthday party! 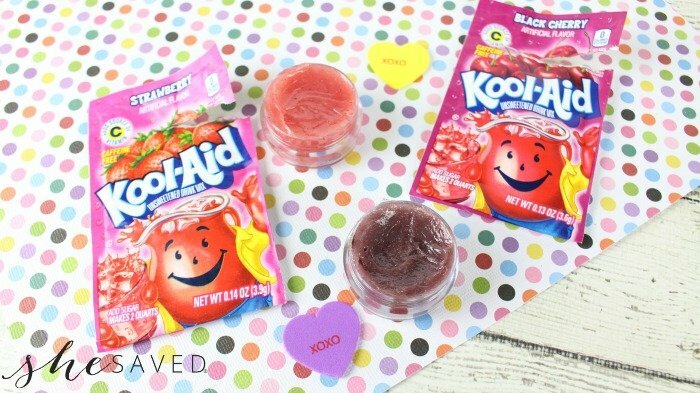 Your favorite flavors of Kool-Aid - I used strawberry, black cherry, pink lemonade and grape. Add 1/3 cup Vaseline to a microwave safe bowl. Microwave the petroleum jelly on high for 40-45 seconds or until soft and mostly melted. Stir. 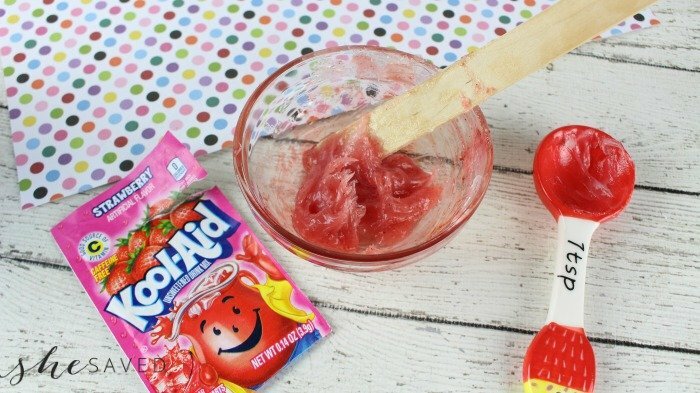 Sprinkle 1/2 teaspoon of your favorite Kool-Aid powder into each bowl and stir with wooden craft stick or spoon. Optional - you can add a pinch of granulated sugar to each bowl if you want the balm to be sweetened. 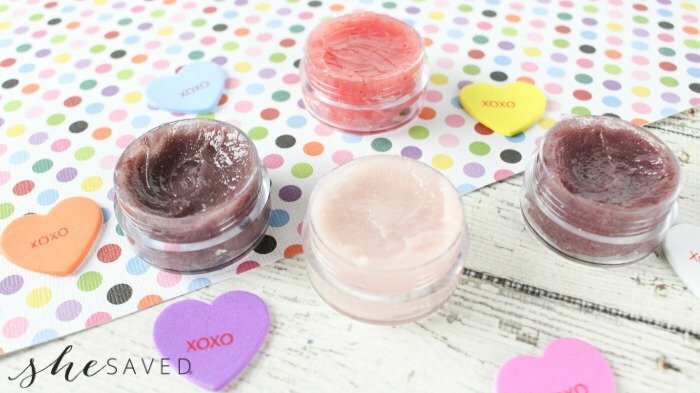 Transfer each flavored lip balm mixture to an airtight container and use for up to 3 months. « 12 STRONG Movie Review and Cast Interviews: 12 STRONG Hits Theaters January 19th! I love this idea. 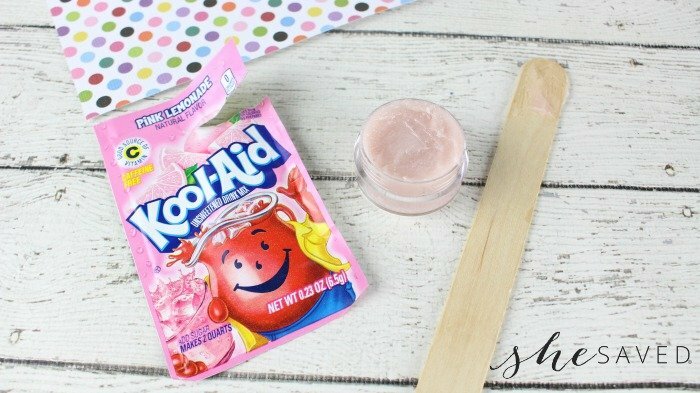 Can you tell me if the pink lemonade comes out colored or natural? It looks very pale. I’d like to do this with a group of very young girls who don’t wear makeup. Thanks!